The “__11” stack at 360 is one of the best 2bd floor plans in that building. Definitely check it out. When you’re done with the open houses, you can enjoy an afternoon on Lady Bird Lake by renting a canoe or kayak from at the Texas Rowing Center. Or, dine al fresco at Annie’s Cafe on Congress Ave for breakfast, lunch, or dinner. Make sure to download my transaction report from June (registered members only) and discuss with a Realtor who lives and works in downtown Austin. As a child of the ’80s, it’s always interesting for me to look back at those years with the benefit of hindsight. Memories of Vision Street Wear and Hypercolor tee-shirts, jeans with tightly rolled cuffs, Michael Jordan, and ubiquitous Patrick Nagel fashion art posters hanging on the walls of bachelor pads around the country. One of the artists, Elisa Jimenez’s – Project Runway alum, and named by Vogue as one of today’s emerging designers to watch – interactive show starts at Domy at 7 p.m. and will feature models unveiling her creations while transitioning the event into a raw and immediate parade to OKAY MOUNTAIN for a final runway-esque presentation at 9:30 p.m.
After “88”, on Sunday., Aug. 8 from 2 to 5 p.m., Jimenez will host a pop-up store at W3LL PEOPLE, located at 215 Lamar Blvd., featuring pieces from the Hunger World, her spontaneous couture and one-of-a-kind “ready-mades” of which she’s built her 14-year career. They are all hand wrought, hand drawn and imbibed with scented oils. Elisa’s celebrity clients include Marisa Tomei, Courtney Love, Cher, Sarah Jessica Parker, Lisa Bonet and Melissa Auf Der Maur, among others. More details on this event are available at http://www.domystore.com. 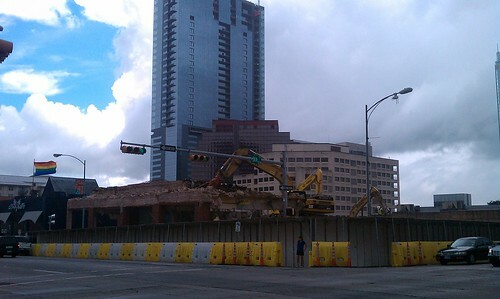 Clearing the way for a new, and much needed hotel in downtown Austin, 201 W. 5th has been demolished. 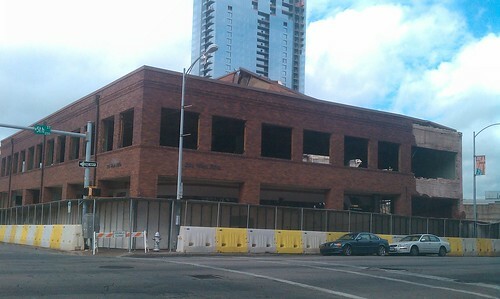 The concept, “1 Hotel” was announced last September and is being designed by BOKA Powell. What is not clear is when construction of the hotel will begin, leaving many people concerned about the blight of more surface level parking. 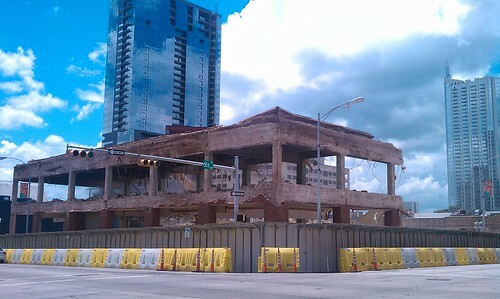 Below are photos taken over the past few days showing the incremental demolition of the old building. 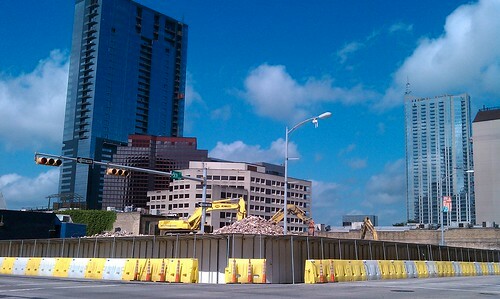 We first learned from Elliott McFadden at Austin On Two Wheels, then earlier today Thomas Butler (DAA staff and Austin CarShare board chair) confirmed for us that Austin CarShare has ceased all operations. Much like the Dillo, we wanted to be a cheerleader for this alternative form of transportation. It didn’t work perfectly, but it did work well for many things. We wanted to see it succeed because we knew the people behind it, and how inspired and passionate they are about the underlying concept. Austin CarShare created the market for this form of transportation in Central Texas, and it’s regrettable to see them close up shop. Not to denigrate the achievements of car2go, but it lacks the bootstrapping ethos evident in Austin CarShare. Truth is car2go works better for most users. Car2go’s presence in more places and the ability to park it [almost] anywhere makes it more accessible to more people. And that’s a good thing for consumers/commuters. Car2go simply has the financial backing to achieve a critical mass of cars and users. Were it not for the entrepreneurial vision of these guys/gals four years ago, inspired to create Austin CarShare, car2go would not likely have chosen Austin to beta test what is to become the largest car sharing program in the world. Brandi Clark with Austin Eco Network puts it more eloquently. Stunning model unit with city views. Upgraded hardwood floors, bathroom tile. The 6th floor is the first floor with unobstructed city and State Capitol views. Perfect for anyone looking for the walkable lifestyle. Furnishings negotiable.